Nathan Dill rounds third base at Bulldog Park. Butler went 1-2 against Creighton on April 12 and 13. Jimmy Lafakis/Collegian file photo. 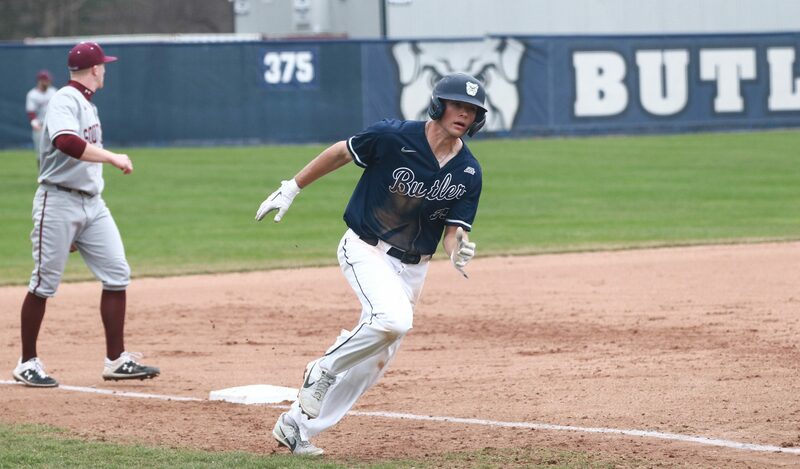 In its second home conference series in as many weekends, the Butler baseball team saw the same result: winning one out of three games. Game one of the series, on April 12, was Creighton’s Big East opener. The Bluejays started off the series with a 8-7 win in extra innings. The Bluejays struck first in the top of the second, but a double from James Gargano and a groundout from Harrison Freed put the Bulldogs up 2-1. RBIs by Kyle Smith, Harrison Freed, and Andy Bennett would put Butler up 5-2 after seven innings. Creighton exploded for four runs in the eighth, though, and another in the ninth. A clutch two-run home run from Freed went the game into extras. The Bluejays would put a run across in the top of the tenth and hold off Butler in the bottom frame to take the opening game of the series. The teams decided to play a doubleheader on Saturday to beat the bad weather coming into town on Sunday. In the first game of the doubleheader, Creighton exploded for a five-run fifth inning to open up a 6-1 lead. It wouldn’t take Butler long to respond, though, as it rattled off four in the bottom of the sixth to cut the lead to one run. The Bluejays added an insurance run in the top of the seventh and Creighton’s John Sakowski shut Butler down to pick up his first save of the year. Butler entered the third game of the series looking to avoid the sweep. That sense of urgency was evident early as Kollyn All’s two-RBI single gave the Bulldogs a lead they would never relinquish. Connor Schultz pitched a gem for Butler, going eight innings, fanning seven batters, and not allowing Creighton to get on the scoreboard. After the series, Butler is looking at an 18-15 record on the season with a 2-4 record in conference. The Bulldogs will next head to West Lafayette, Indiana, to face off against in-state rival Purdue. The Bulldogs defeated the Boilermakers in these teams’ last matchup in 2017. First pitch from Purdue on April 16 is scheduled for 7 p.m.